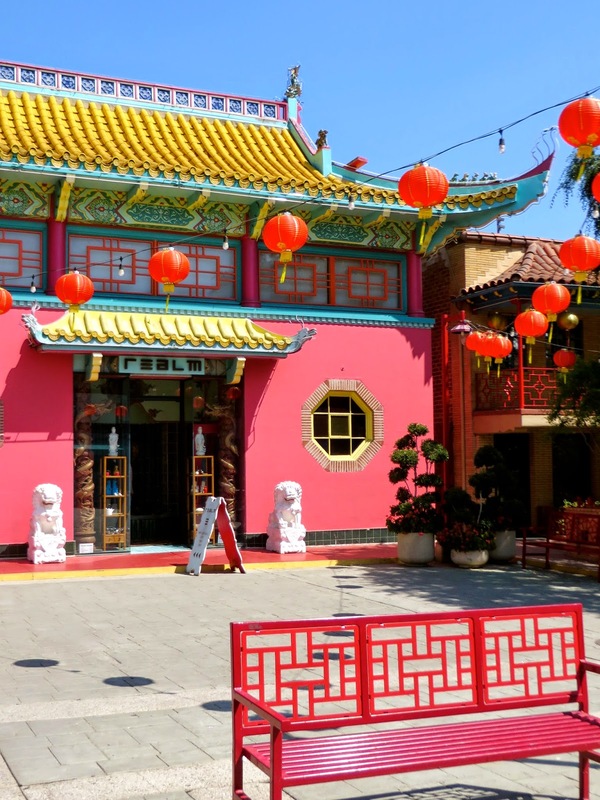 Last weekend I didn't intend to go to Chinatown in Los Angeles, I just sort of wound up there after my plans went awry. You see, I wanted to go to the L.A. Opera Costume sale, which essentially was a huge garage sale for old L.A. Opera costumes. While I didn't intend to buy anything, I thought it would be fun to look around, especially after hearing about the "Diva Rack" that featured elaborate costumes worn by famous divas that were selling for $1000 and up. Well, apparently hundreds of other people thought it would be fun too and this resulted in no available parking and a line going around two blocks of the Arts District in L.A. C' est la vie! So, as a back up, I reached into the recesses of my mind to my "to do list" and realized that it would be a perfect day to check out a trifecta of Los Angeles sights that I hadn't seen before, even though they are a bit on the "touristy" side. 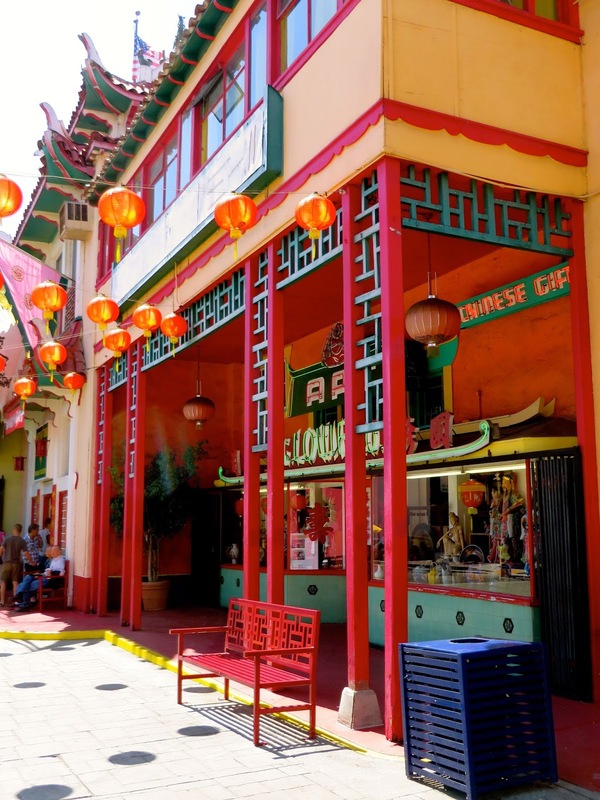 These sights included: Chinatown, Olvera Street, and Union Station. All of these destinations are situated around the same little area of Downtown Los Angeles, so it was easy to hit them all in one fell swoop. Below you will see the Chinatown portion of my excursion. 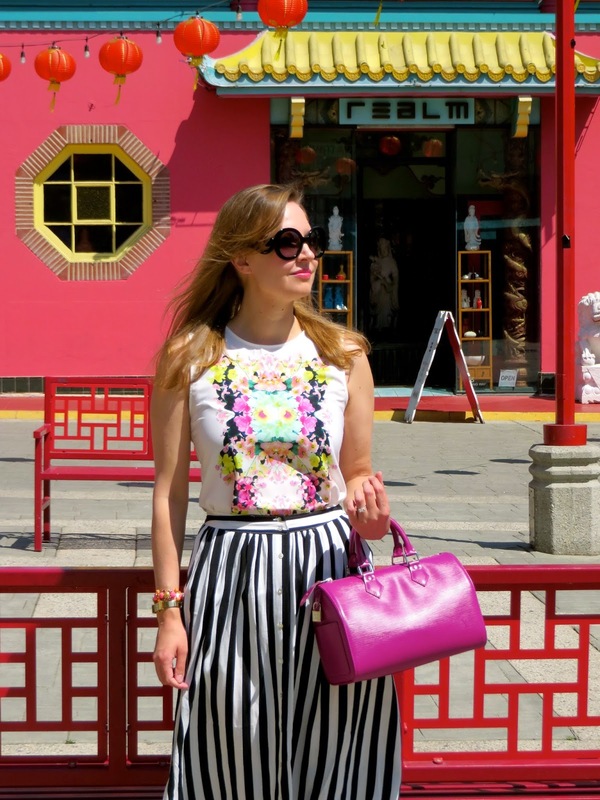 Like my wardrobe, Chinatown is filled with bright colors and fun patterns galore! 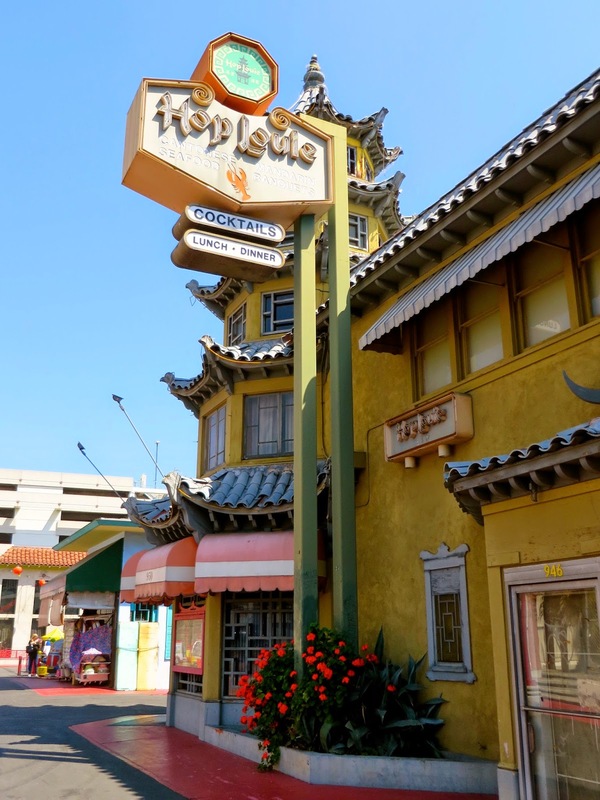 After touring around Chinatown, my husband and I went to the famous Hop Louie for lunch. 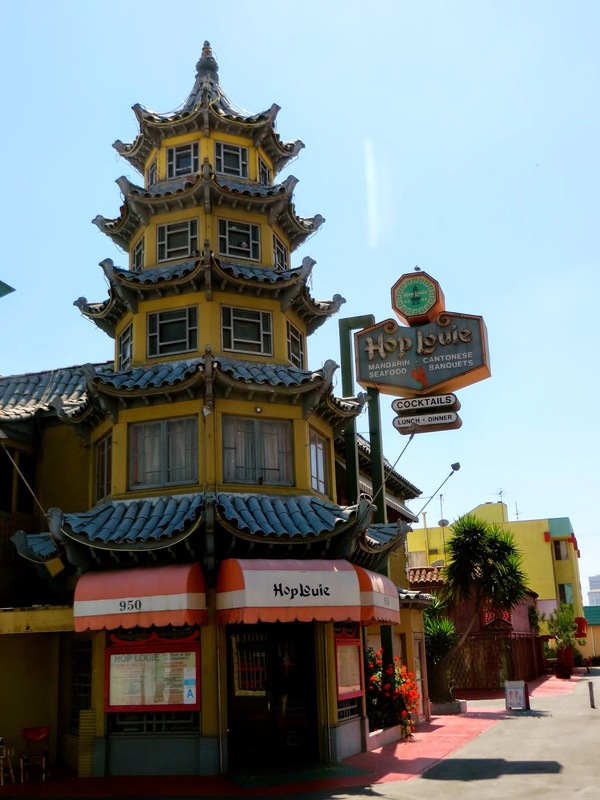 Hop Louie is a cultural landmark built in 1941. I am not going to sugarcoat anything: the food is pretty mediocre, but at $5.50 per person for the lunch special, which includes soup, an entree, pork fried rice, cookies and tea, I can't really complain. Plus it has a cool, kitschy vintage vibe that makes you understand why some celebrities still sometimes haunt the location and why many films and TV shows have been shot here. So that concludes by sojourn to Chinatown. It's a fun place to hang out and get a taste for something a little different. My adventure just goes to prove that sometimes it's better not to have a plan and to improvise with what you've got. Plus, it's great to be able to check a few things off my to do list! Thank you Irene! 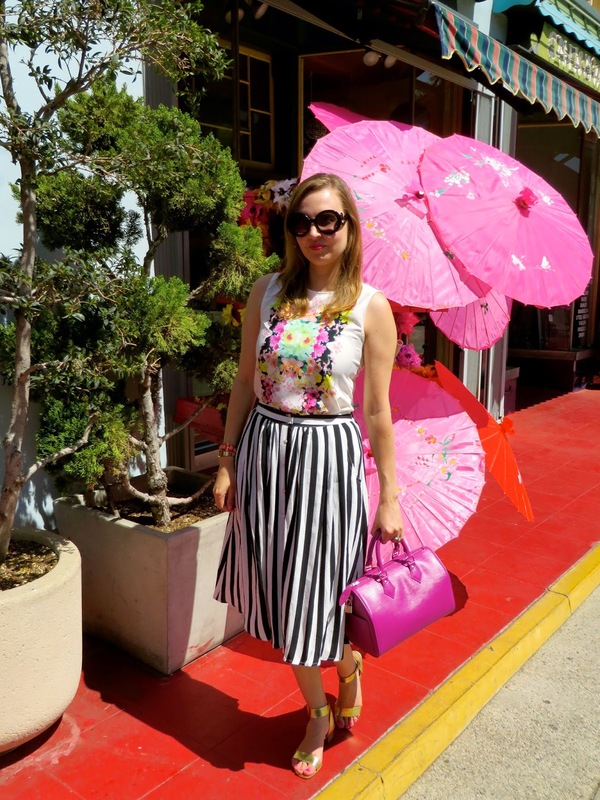 It was super hot last weekend in L.A. so it was the perfect occasion to break out summery clothes. 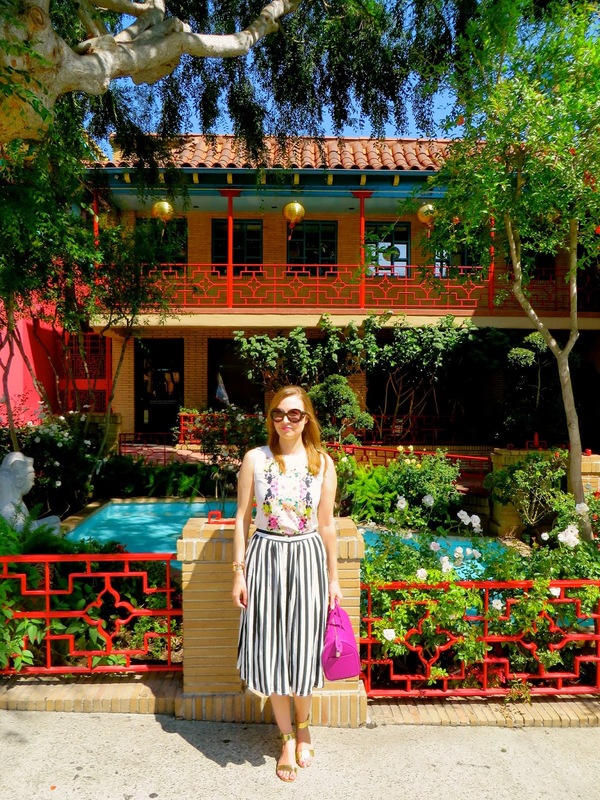 That is a gorgeous Little China, so vibrant, colorful and fun just like your outfit. 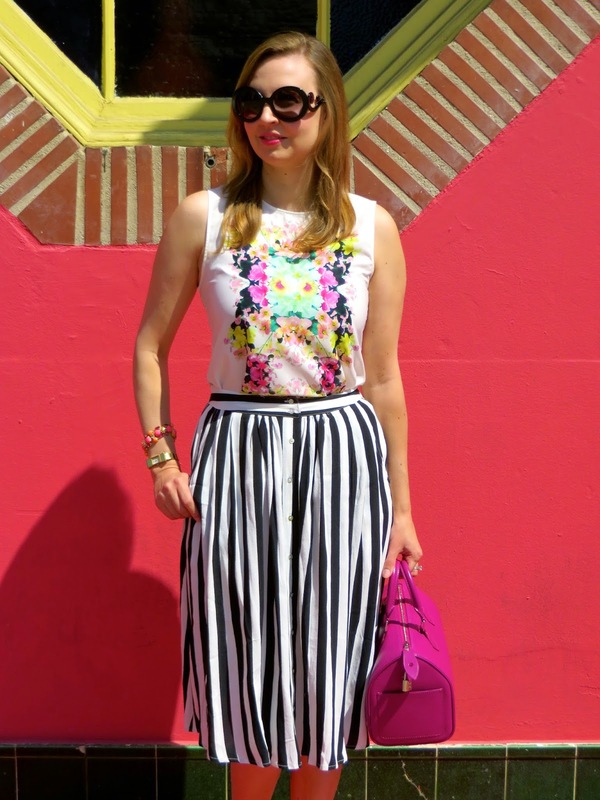 I adore the retro midi skirt and that floral tank is so cute! P.S. Did you get a chance to see my E-Mail. Let me know. Thanks. Thank you Ada! 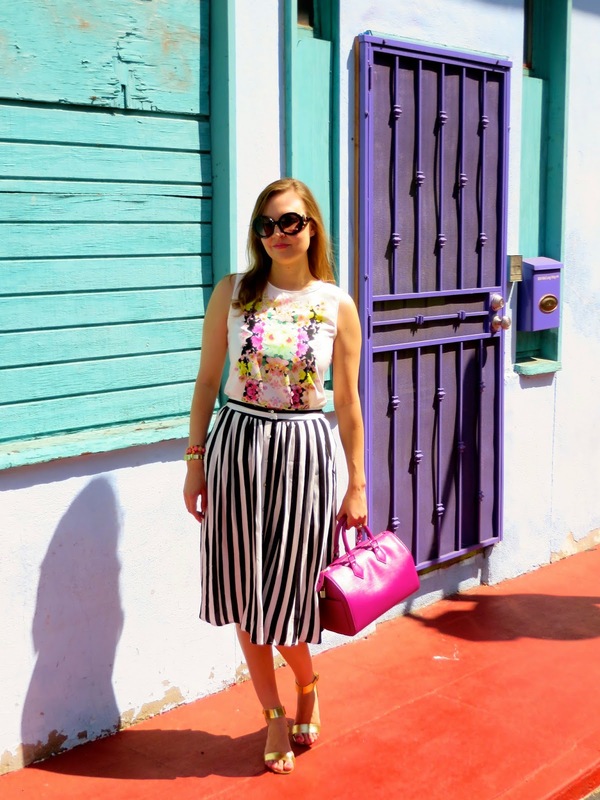 I love midi skirts (like you), and this one was perfect for summer! 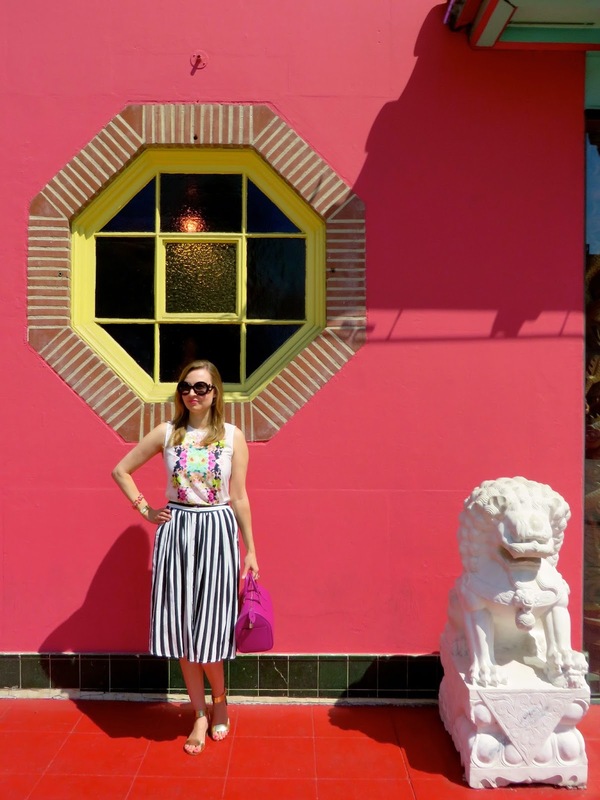 That is such a cute striped skirt! Thank you Julie! I appreciate you stopping by! What a colourful place! Very beautiful photographs. You too look beautiful, what a nice mixture of patterns! 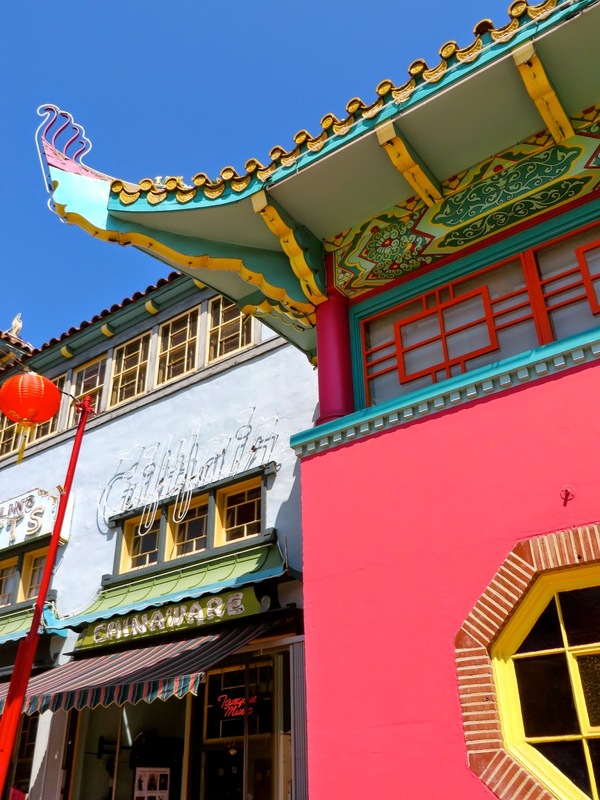 Yes, Chinatown (at least this section) is filled with so many pretty colors and sights. Thanks for checking on my post and saying hello! 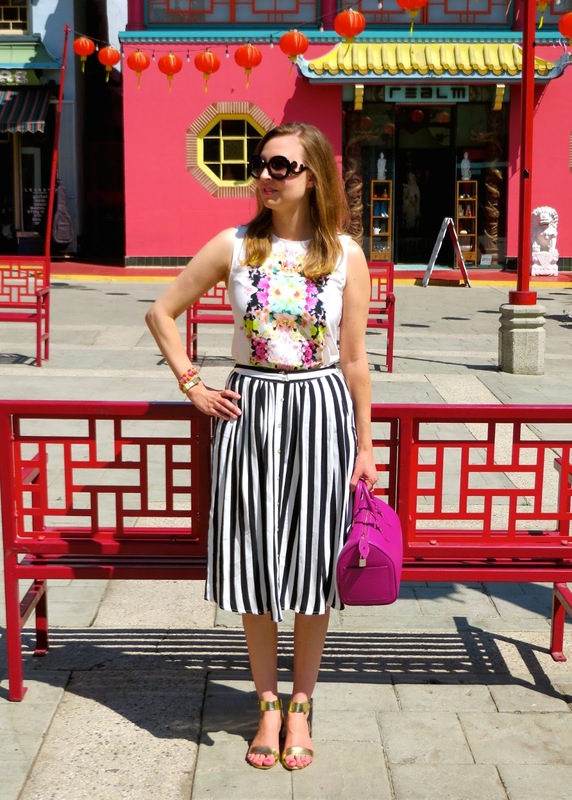 LOVE the mix of stripes and floral! You look FAB! Thanks Darlene! I wasn't sure what to pair this skirt with, but I thought the bright floral would be perfect! Hello ! This looks like a fun time and place.Love the background shots too. I always love your style, and love the combination of the striped skirt and floral top. I need to try and mix stripes and florals. Thank you for being a part of Turning Heads Tuesday! Yes, even though I didn't intend to be in this location, the backdrop worked out perfectly! Definitely try the stripes and floral combination... you could totally rock it! Thanks for hosting the link up! Beautiful photos!! Love your skirt! Thank you! This skirt sold out online, so apparently it was super popular. Thanks for stopping by! Glad you were able to check out some LA sights even though your plans didn't work out. 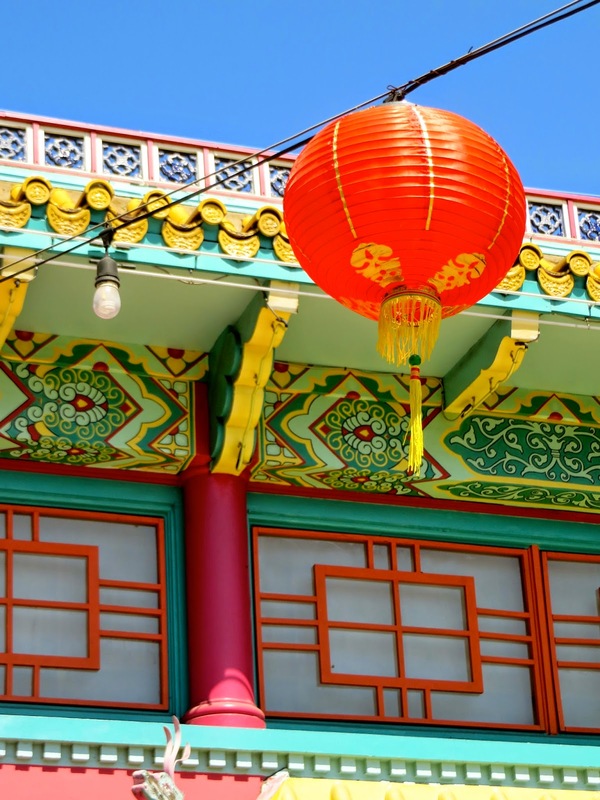 I've lived in Southern CA for 15+ years and have not gone to Chinatown or Olvera street yet. 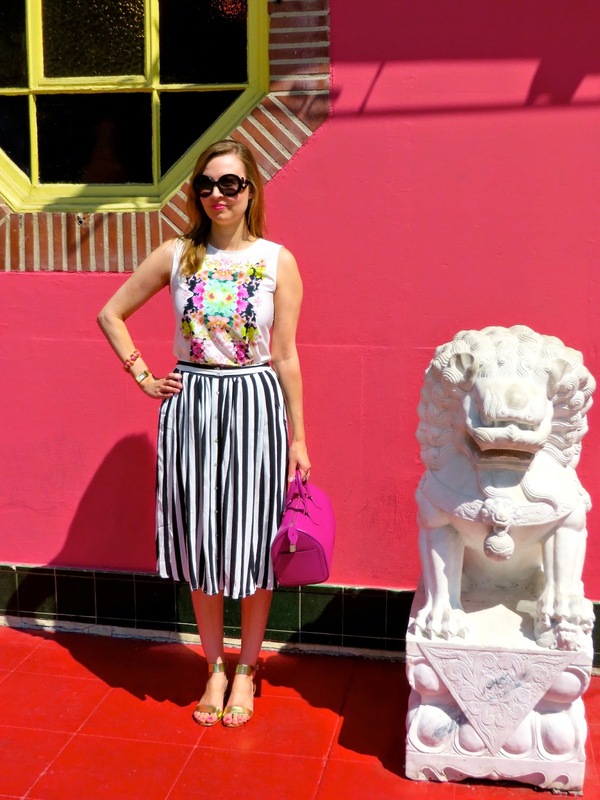 Your outfit is perfect for LA weather. I know! I have lived here almost 10 years and there is so much I haven't done. It's sometimes fun to be a tourist in your own city and check out "attractions" like this. I also recently visited Chinatown. So fun to see it from another person's perspective! How cool! I also love to view things through other people's perspectives. Everyone always has their own spin on things. Thanks for stopping by!